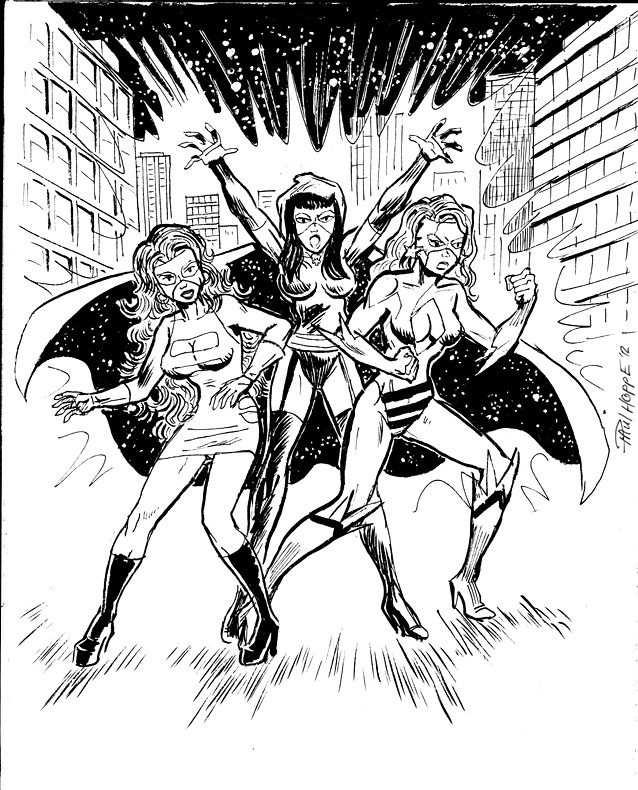 During The Beholder's travels through the universe, the world of AC Comics caught his eye, especially the super-powered adventurers group called FemForce. 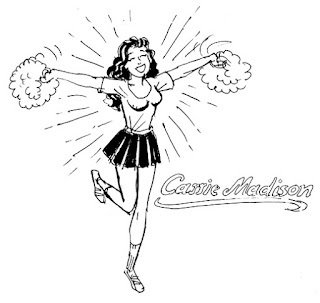 The characters depicted are Synn ("The Girl From L.S.D. "), Nightveil, and Miss Victory. 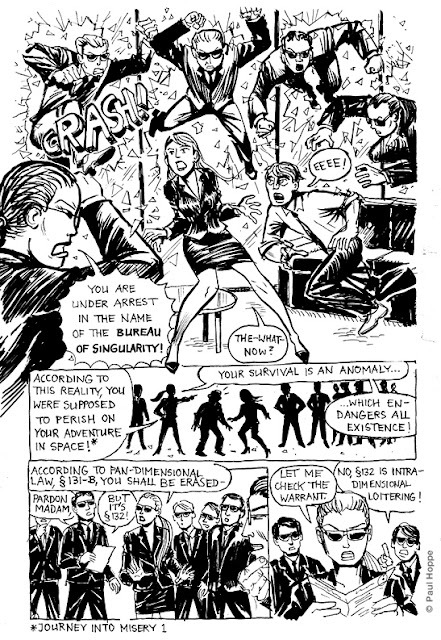 AC Comics uses a lot of redesigned Golden Age super-heroes that time forgot and fell into public domain, and mixes them with original characters. 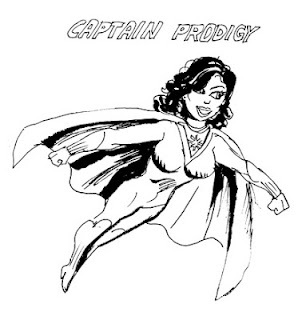 Nightveil is based on the Golden Age superhero Phantom Lady. 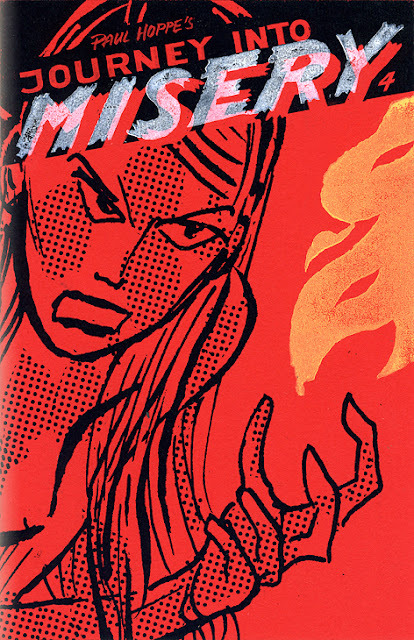 Miss Victory originally created by artist Charles Quinlan and an unknown writer. 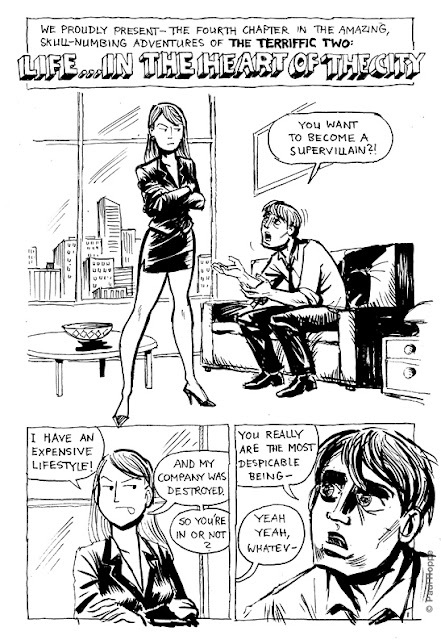 Synn is an original creation of Paragon Comics / AC Comics. 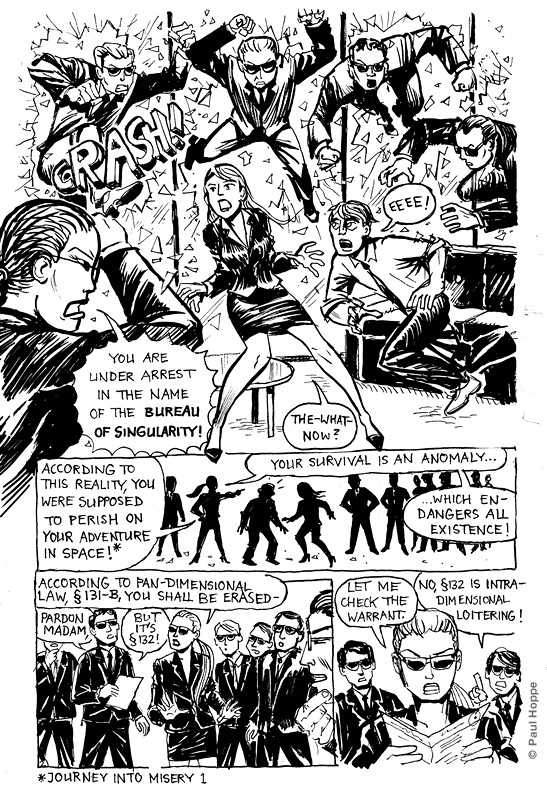 Yes, we are starting a brand-new chapter here on The Beholder, serializing the next chapter in the astonishing, mind-boggling mis-adventures of The Terrific Two. Starting Monday! 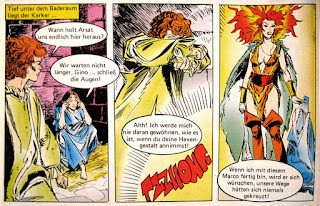 This one was done for the blog RePaneled, it's a loving tribute to the German comic series Spuk Geschichten (Spooky Stories). 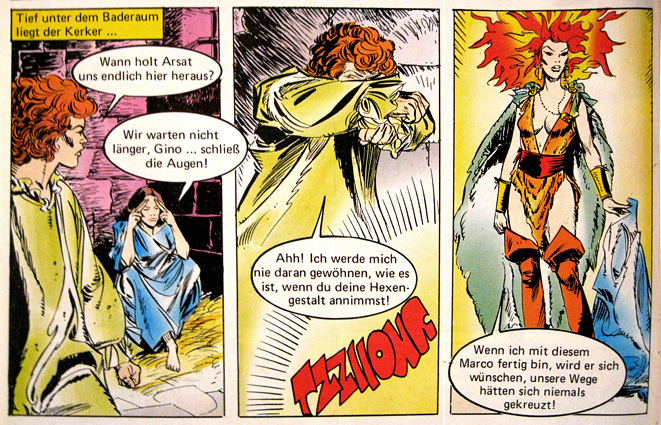 On the left, you can see the original panels, from issue # 327. About Spuk Geschichten(Spooky Stories): A guilty pleasure, as it was very pulpy, with monsters constantly running after half-naked women. It was one of the few series that were actually available at newsstands in Germany. (although it's spelled with a "wave" above the "u", and a pointy thingy pointing up, above the "n". 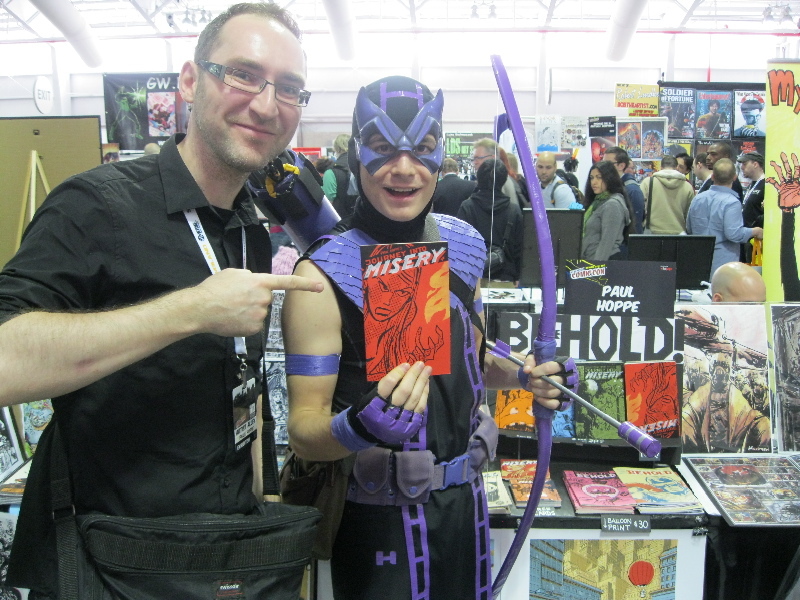 Great times last week at New York Comic Con. Many mini-comics were sold, and a nice time was had by everybody. The experiment was a full success and I might have to come back next year! Besides conversations with all-time greats such as Herb Trimpe, Rich Buckler and Bon Wiaceck I also got to meet Erik Larsen and tell him how much I've been enjoying his work. Finally, this was the place to meet actual super-heroes in person, a prime exable of which can be seen to the left. 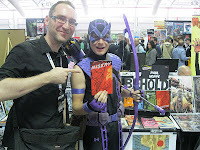 I couldn't wish for a better endorsement of Journey Into Misery 4 than by Mr. West Coast Avengers himself, the amazing Hawkeye! just like you and me and everybody else. Indeed, where which other wonders will science bring us next? The Beholder was inspired to interpret some characters from around the internet. Gwenna is not really an Open Source character, but an obscure Golden Age character that fell into Public Domain and came to new life in a webcomic created by Jay042, where she and her partner actually run around the jungle sans fabric. The characters of Astro-Man and Captain Prodigy are available for use by anyone, with only one condition. 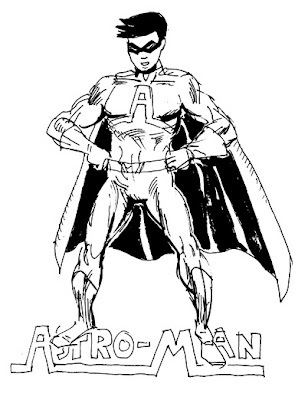 This paragraph must be included in any publication involving Astro-Man, in order that others may use this property as they wish. All rights reversed. Carrie Madison (created by "SimonKirby") is free to use by anyone, and as mentioned, Gwenna's modern appearance is created by Jay042. Captain Prodigy is created by Michael P. aka Yzz, and Astro-Man is created by the Free Universe Community. 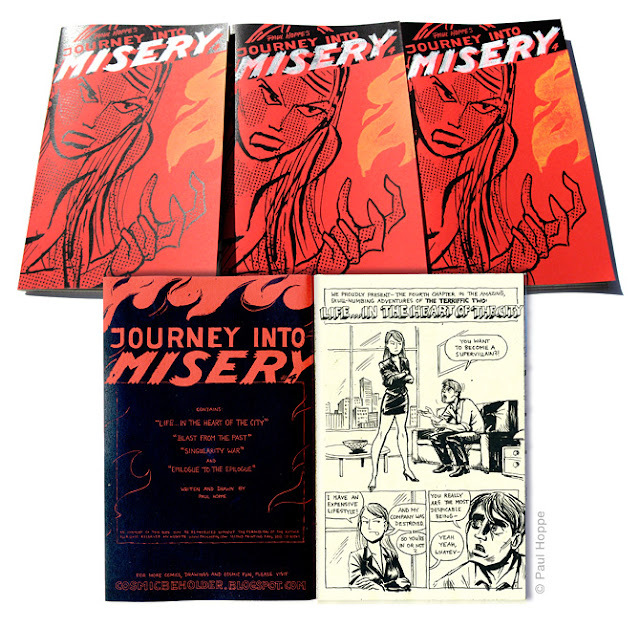 New York Comic Con is just around the corner, and here is the special edition of Journey Into Misery 4 that will come out at the event. This version is all hand-made, and the cover has a two-color block print, on top of a xerox, on colored paper. 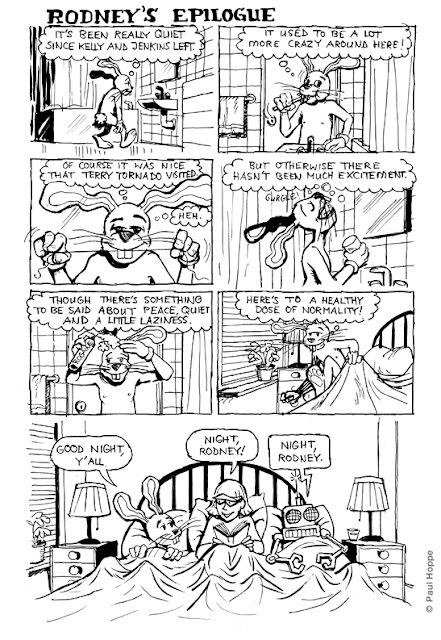 Even the content is slightly remastered, so if you didn't get the book at MoCCA, you can have an even better version now! All other mini-comics will be available as well, and there will be even an advance readers copy of the graphic novel Peanut on display. 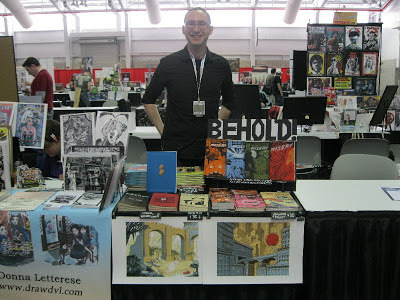 The Beholder will descend onto the Artist Alley, table CC18. New York Comic Con is being held at the Javits Center (655 West 34th Street) in Midtown Manhattan. This year NYCC's Artist Alley will be at the North Pavilion of the Javits Center. The official New York Comic Con website is here. Come see me, if you dare!